Every once in a while, something happens and you eventually find yourself taking a walk home in the dark. The unfortunate truth is that not every corner, alley, or street is as well-lit as you’d like, and these are the dark corners that people with malicious intentions often prowl for vulnerable and half-blind prey. Don’t be one of those guys who end up getting mugged because they were too dumb to either bring a flashlight or something they can use to protect themselves. 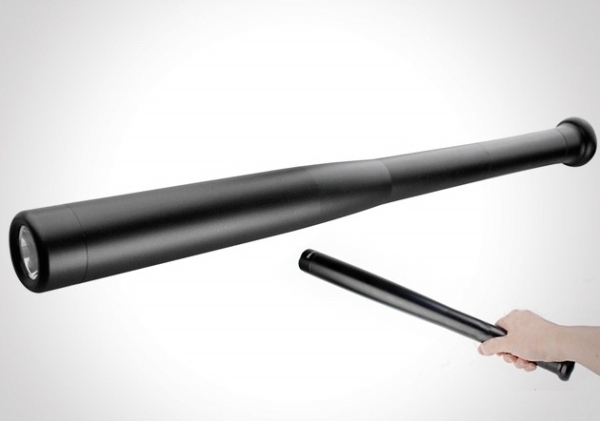 Incorporating both functions into one is the Baseball Bat flashlight, which comes in two handy sizes that’ll offer you protection you can hold and a bright light you can cast: 5 1/2” or 23 1/2”. It’s equipped with a powerful LED that has a range of 450 feet, so you can see exactly where you’re going. Get one for yourself, get one for your best bud, and get one for your favorite girl. It doesn’t hurt to be protected.